Perfect for Multiple Couples and Families! Main Floor - Entrance Main Floor - Dining Area seats up to 8 Living Room toward Kitchen - Main FLoor Main Floor - Master Suite Main Floor - Kitchen Main Floor - Master Suite Main Floor - Bedroom 1 - Ensuite Bath for King Suite Upstairs - Bedroom 2 - King Suite Upstairs - Bedroom 2 - Ensuite Bath for King Suite Upstairs - Bedroom 3 - Queen Upstairs - Bedroom 4 - Two Twin Beds Downstairs- Family Room and 2nd Kitchen Downstairs - 2nd Kitchen and Living Room Kitchen Island - Basement Floor Basement - Bedroom 5 - King Suite Downstairs- Bedroom 5 -Ensuite Bathroom Downstairs - Sitting Room with Laundry Room and Sauna. Spend your vacation in the lap of luxury at C602! Boasting an in-unit dry sauna, private hot tub, two-full kitchens, and plenty of space to relax, you can enjoy the mountains in comfort at three-story townhome. Main Level: Kitchen, living room, dining room (seats 4), half bathroom, master suite bedroom with bathroom, patio, and entrance to two car garage. Upstairs: One master suite bedroom with full bathroom, 2 standard bedrooms, laundry room, and hallway full bathroom. Basement: Master suite bedroom with bathroom, half bathroom, kitchen with bar seating (4), laundry room, dry-sauna, and living room with TV. Bedroom 1: Master suite -1 King bed with full ensuite bathroom with jetted tub, glass shower, and double vanity. Pull-out sofa sleeper. Bedroom 3: 1 Queen bed with hallway bathroom. Bedroom 4: 2 Twin beds with hallway bathroom. Bedroom 5: Master Suite - 1 King Bed with ensuite bathroom. 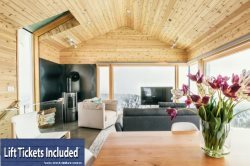 We are truly excited and honored to share our homes with each and every guest and we invite you to stay with us at Powder Mountain Getaways - C602!